Regular users are all members of the Kanbanize account with no "Account Owner" Privileges or a "Workspace Manager" status. They can operate with the cards, search and filter account data, create own widgets and configure their personal board settings, card view, and notifications. Before you start with Kanbanize, it is recommended that your PM organizes training for the collaborating teams so that each member is introduced the key Kanban principles. The training must include a review of the created boards, as well as clear descriptions of processes. When everyone is familiar with the common goal, they would be able to work and suggest changes that will move your team in a positive direction. The Dashboard is the entry point of your Kanbanize account. This is the place where all your Workspaces (1) and Boards (2) are located. Once you access your Kanbanize account, you will see all Workspaces and Boards to the left half of your Dashboard. 1.1. The Workspaces are visualized by a blue ribbon. Think of it as the asset that collects all Boards of different departments in your organization. You can create as many workspaces as needed. 1.2. The Kanban board is the tool for mapping and visualizing each step of your process as a flow. The Kanban board is usually named after your department or the project you are assigned to work on. - Requested - the area where you place the work that you plan to work on next. - In Progress: when you start working on a particular task/card, you have to move it to "In Progress". - Done: when the task is completed -> move it to Done. The swimlanes are used to differentiate classes of work i.e. Defects; Features. For more detailed mapping of your process, your PM can create as many subsections as you need in order to reflect your unique workflow. For example, a development team may have a Kanban task board that consists of multiple columns and swimlanes. 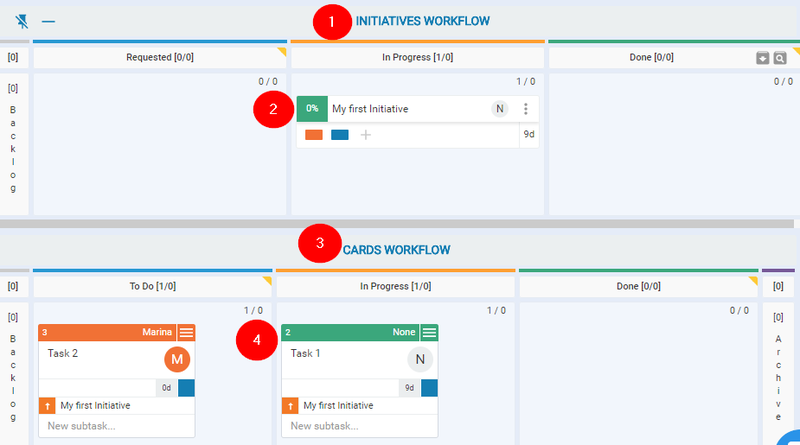 By default, your Kanban Board consists of the: Initiatives Workflow(1) and Cards Workflow(3). Your Workspace Manager can set the board to display either flow or both - it depends on the use-case. The Initiative Workflow is the home of automated portfolio lanes, where Senior Managers easily track the progress of the bigger tasks or projects. Work items in this workflow are called Initiatives and they move through the workflow completely automatically when their child cards are moved anywhere in your account. The Initiative is a Project/Feature/Epic, etc. and you/the PM have to break it down into smaller work items in the Card workflow, where tasks are to be processed. How does it work? When all child cards linked to the Initiative are moved to "Done", the whole Initiative will automatically move to "Done". The Card Workflow is where all of the Kanban cards that your team works on live. The Kanban card represents a task. It carries information and details about the task itself, e.g. who is responsible for the task; title and description of the task; how big the task is; what is the card priority, etc. 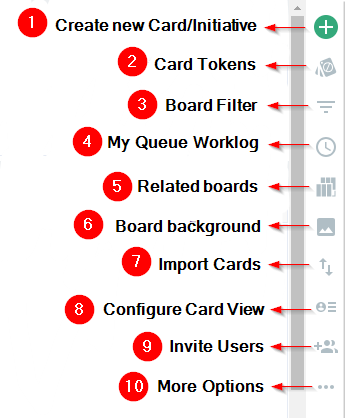 There are many ways to create a card in Kanbanize. Move cards to indicate work progress on your workflow. - The Card context menu provides a shortcut to a lot of functionalities. - If you want to get your colleague’s attention (a registered Kanbanize user) on a specific topic or simply want to communicate via the card, you can use the “@” mention symbol. - You can send emails directly from the Comment tab of the card via the "Send as Email" option. Use the default email address yourcompanydomain_notifications@kanbanize.com to send emails to registered Kanbanize users. If you send emails to non-registered emails -> the email will be delivered but any replies will be lost. The features located on the sidebar to the right of your board interface helps you to easily manage and control your account. 1. Create a new card - by default, the card will be created in the "Requested" column. 2. Card Tokens- the card tokens allow you to block cards or additionally mark them with a certain label for categorization. There are two types of card tokens Blockers and Stickers. 3. Board filter - applying the Board filter allows users to locate/filter cards per board and filter out the information which is relevant to their search. 4. My Queue & Worklog - use it to quickly see at a glance all cards, which are assigned to you, across all Workspaces and boards and check how much time was logged on every task. 6. Board Background - make your workflow more stylish and flamboyant by adding an image or set a color as a background of your board. 7. Import and Export cards from you account. 8. Configure Card View settings to display data and personalize your card view. 9. Invite a new user - only Account Owners can invite new users to the account. 10. More options: Calendar / Board settings/ Board screenshot: to take a screenshot of the entire board. Use the Dashboard button on the top left side of the board to go back to the entry point of your account and take advantage of the other useful features and options in Kanbanize. 1. The Advanced Search (1) - use the search option to quickly search for a card by typing a keyword or a card ID -> press the Enter key and the system will display the matching results in a table view. Use the magnifying glass to filter and configure the data in your account and group together information to generate a different type of reports. 2. Help Center (2) - check our Help center to learn how to make the most of Kanbanize. You can filter out your results to open a video, knowledge base article or a tutorial. 3. Notifications (3) - sign up for in-app or email notifications to keep track of your team's activities and/or your own actions. You have the option to subscribe only for notifications, you are interested in. Important: Notification settings are configured per board! 4. My Account (4) lets you easily manage your account details, time zone, change password, etc. 5. Use the retractable menu (5) to add a predefined or custom widget and customize your dashboard by adding colors and backgrounds. Through widgets, you can pin important information from your account directly on your dashboard such as: "Overdue cards assigned to you"; "Blocked cards assigned to you", etc. The allowed actions and permissions for your user role might differ depending on the user role that has been created for your email. Only Account Owners and Worksapce Managers can create and modify user roles. If you need an additional help with the software, you can find more guides in our Knowledge base or get in touch with our support and customer success teams.